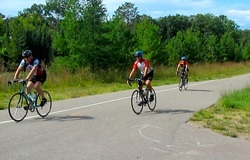 With scenic beauty, easy access, unique trail towns, and convenient services the Paul Bunyan Trail is a great adventure for cycling enthusiasts of any skill level. Find many options along the trail for biking equipment sales, service, and rental opportunities. 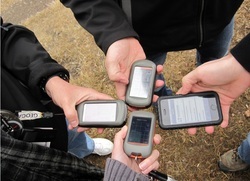 Geocaching - discover the high-tech treasure hunting game played throughout the world by adventure seekers of all ages equipped with GPS devices or their mobile phones. The basic idea is to locate hidden containers, called geocaches, outdoors and then share your experiences online at Geocaching.com. The Paul Bunyan Trail communities from Brainerd to Bemidji offer many opportunities for the adventure seeker. The Paul Bunyan Trail offers miles of scenic trails accessible from many points along the way including the unique trail towns and other access points along the way. 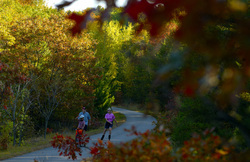 For fitness, fun, or both, the trail offers excellent opportunities for inline skating, running, and walking. Trail mile markers help you establish how far you have traveled so you can plan your adventure and gauge your distance. 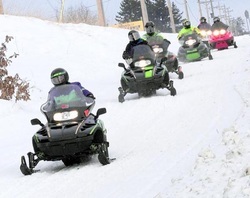 In the winter the Paul Bunyan Trail becomes part of one of the best snowmobile trail systems in the Midwest. Easy access and unique trail towns in addition to the natural beauty of the trail make for a memorable Minnesota snowmobiling getaway.